Following up on this earlier post, I have tried to find out how much carbon dioxide is emitted in the process of manufacturing new cars. If this amount is substantial, it calls into question the GHG benefits of replacing inefficient cars with more efficient cars. Honda reports that it emits less than a ton of carbon dioxide producing each vehicle. To put this number in perspective, a 20 MPG car will emit 50 tons of CO2 over 100,000 miles; a 30 MPG car will emit 33 tons of CO2. The ton of CO2 emitted when producing a new car is a trivial proportion of the CO2 emitted when driving. Consistent with Honda's claim, this WRI report says that assembly accounts for 2% of total carbon emissions from cars. The implication: The carbon emitted to produce a new car is not a compelling reason to oppose the Cash for Clunkers plan. Gas savings will make up for the manufacturing emissions in less than a year's worth of driving. See the blog archive on the right for newer posts on Cash for Clunkers. The Senate is now considering a Cash for Clunkers program, introduced by Dianne Feinstein, Susan Collins, and Charles Schumer. The bill has also been introduced in the House. The program works by subsidizing car owners who trade in a highly inefficient car for a car that is above average in efficiency. Jason Bordoff of the Brookings Institution recently made the case for a Cash for Clunkers program in a Detroit Free Press Column and a Brookings Institution Paper, as did Dean Baker of CEPR at Truthout. Alan Blinder proposed a Cash for Clunkers program in July 2008 and reviews similar programs that have been implemented in several states. GPM makes clear why this is a brilliant idea--the gas savings and CO2 reduction of removing a 14 MPG for a 25 MPG car is huge (3 tons of carbon dioxide over 10,000 miles). There is no possible improvement that can be made to a 33 MPG to reduce carbon emissions by that amount. And, of course, it is a way of stimulating car purchases during the current economic crisis. The 14 MPG to 25 MPG improvement eliminates 300 gallons per 10,000 miles, or 3 tons of carbon dioxide. Eric De Place at Sightline Daily endorses the idea. There are a few moral hazard issues with this proposal that I'll let the economists sort out (i.e., junkers sitting in a yard are fixed up to make a couple of thousand dollars, but the car is worth less than the bounty, and removing it yields no carbon reduction). The proposal addresses this issue by requiring that the car be registered in the previous 120 days. MPG can be a misleading measure of fuel economy when comparing two cars. For a full explanation of why it is misleading, read the posts here and here. Focusing on gas consumption, and not MPG, gives you an accurate sense of fuel economy and carbon dioxide emissions. If you are interested in a Cash for Clunkers trade in, use the calculator below or these charts to see the gas and cost savings of a trade. 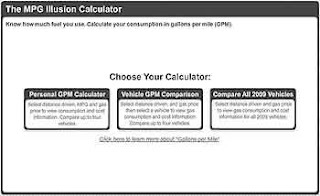 The following calculator helps you convert MPG to "gallons per mile" (GPM) so that you can see the gas consumption of different cars. You can select a distance, gas price, and MPG level of your choice. You can compare the GPM of all new 2009 vehicles. Click the image to access the calculator. The first calculator allows you to convert a car's MPG to GPM for an MPG level and distance of your choice. You will also be asked to enter a gas price to see the cost of driving that car for your chosen distance. The second and third calculators allow you to compare the GPM of new 2009 vehicles. You will also be asked to enter a gas price to see the cost of driving the cars you are comparing. The MPG figures come from the EPA website fueleconomy.gov (which provides an option for comparing cars based on gallons per 100 miles). If you are interested in downloading excel sheets and printable tables that convert MPG to GPM, go to the section on this webpage called Tools for calculating GPM from MPG. Chris Shea summarized the argument for "Gallons per Mile" in the 2008 New York Times Magazine "Year in Ideas" issue. If you would like a calculator that converts different combinations of metric (kilometers per liter, litres per 100 km), imperial gallons (as used in Britain), and US measures (such as MPG and gallons per 100 miles), this calculator and this calculator covers it all. Illustrating a basic math concept (inverse relationships) with a consequential consumer decision. Start by looking at the MPG Illusion teaching materials gathered at the terrific Social Psychology Network site. (These materials received an honorable mention for Action Teaching.) The SPN site is full of teaching resources, articles, and links related to social psychology and psychology in general. Teaching notes - These notes focus on how to use quizzes and other materials to teach about the MPG Illusion in psychology classes. The MPG Illusion may also be of interest in economics and math classes. Slides - These powerpoint slides contain quizzes, graphs and tables, results from the Science studies, and slides that connect the MPG Illusion to other topics. Additional topics - These notes describe ways to use the MPG Illusion to lead into more general questions about greenhouse gas (GHG) decisions and about "nudges." Math teachers: The NSF has a special report on math education that includes the MPG Illusion.